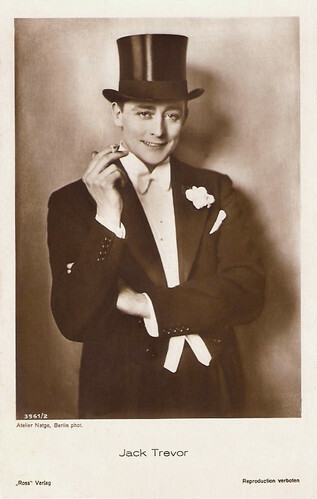 British gentleman actor Jack Trevor (1890-1976) had a great career in the German and Austrian silent cinema of the 1920s. 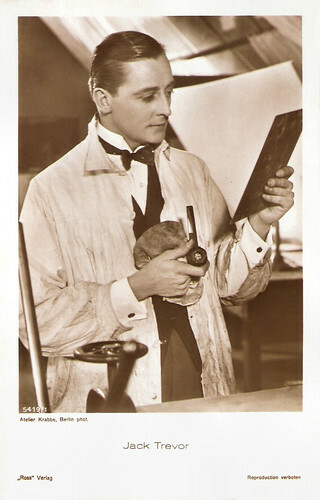 During World War II the Nazis forced him to appear in anti-British propaganda films. German postcard by Ross Verlag, no. 2099/1, 1927-1928. Photo: National. German postcard by Ross Verlag, no. 3961/2, 1928-1929. Photo: Atelier Natge, Berlin. German postcard by Ross Verlag, no. 4153/1, 1929-1930. Photo: Fayer, Wien. Austrian postcard by Iris-Verlag, no. 5778. Photo: Pan-Film AG. Austrian postcard by Iris-Verlag, no. 5006. Photo: Sascha. Jack Trevor was born as Anthony Cedric Sebastian Steane in London-Lambeth, Great-Britain (according to IMDb in Berlin, Germany) in 1890. He came from a well-to-do, upper-class family and went to study at the New College in Oxford. During World War I, he served for the Manchester Regiment. He won the Military Cross and was wounded in 1916 which led to his release as a so-called war-disabled person. He married the Austrian Alma, an alleged daughter from the famous liaison between baroness Mary Vetsera and the Austrian Crown Prince Rudolf. His wife committed suicide one year after their wedding. 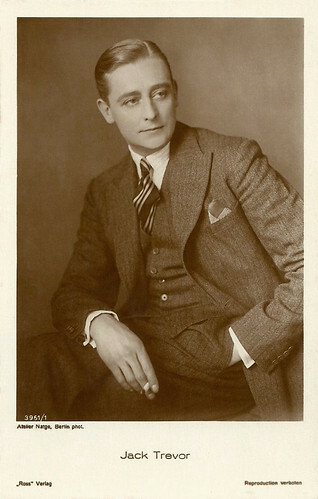 In the early 1920s Jack Trevor started to work for the silent British cinema in films like Petticoat Loose (George Ridgwell, 1922) with Warwick Ward, and Pages of Life (Adelqui Migliar, 1922) with Evelyn Brent. After a few years he moved over to the booming German film industry. 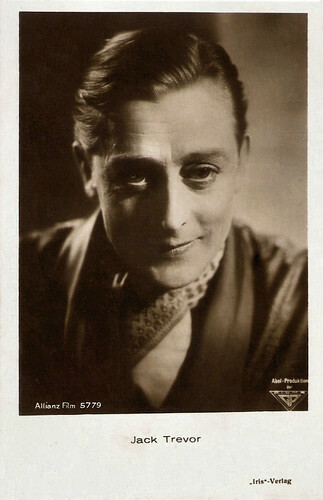 When Trevor (sometimes credited as Jac Trevor) got a film offer from director Friedrich Zelnik to appear with Hans Albers and Lya Mara in Die Venus von Montmarte/The Venus of Montmartre (1925), he accepted it at once. 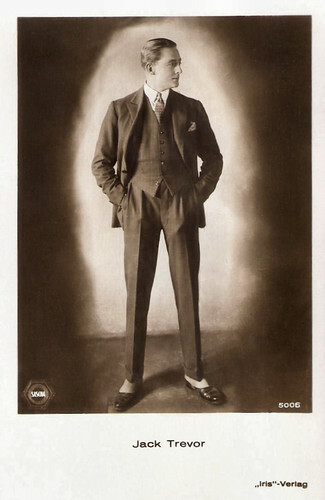 That year he also appeared with stars like Lil Dagover, Emil Jannings, Jenny Jugo and Conrad Veidt in Liebe macht blind/Love Makes Us Blind (Lothar Mendes, 1925), and opposite Lily Damita in the hit Fiaker Nr. 13/Cab nr. 13 (Mihaly Kertész aka Michael Curtiz, 1926). To his other well-known films of the 1920s belong Geheimnisse einer Seele/Secrets of a Soul (Georg Wilhelm Pabst, 1926), Der goldene Schmetterling/The Golden Butterfly (Michael Curtiz, 1926), Die Frau ohne Namen/The Woman Without a Name (Georg Jacoby, 1927), Der Katzensteg/Betrayal (Gerhard Lamprecht, 1927), and Die Liebe der Jeanne Ney/The Love of Jeanne Ney (Georg Wilhelm Pabst, 1927). 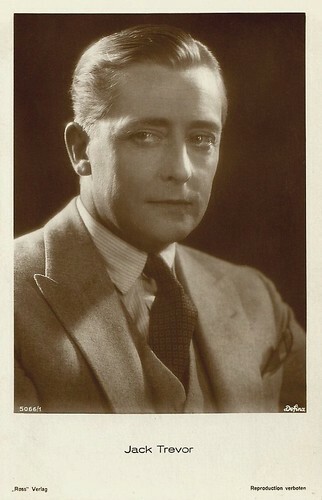 In 1928 he appeared in an uncredited part in Alfred Hitchcock’s Champagne (1928) starring Betty Balfour. Trevor always played aristocrats and high officers. 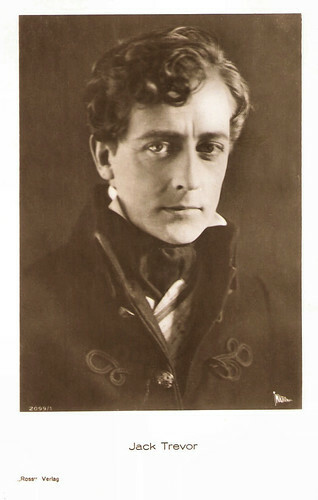 In fact he impersonated on screen what he was in his private life: the typical English gentleman. 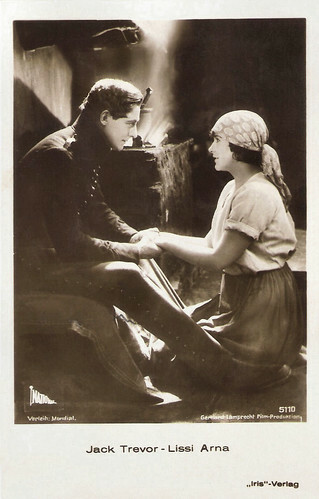 Other silent films in which he appeared were Moderne Piraten/Modern Pirates (Manfred Noa, 1928), Abwege/Crisis (Georg Wilhelm Pabst, 1928) and Narkose/Narcose (Alfred Abel, Ernst Garden, 1929). Austrian postcard by Iris Verlag, no. 5358. 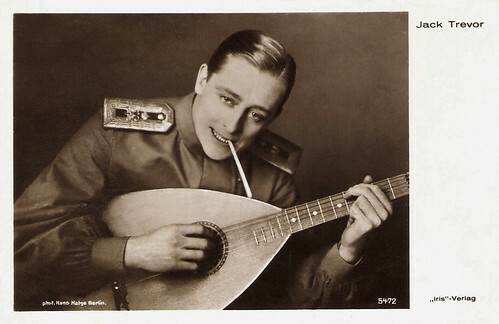 Photo: Pan-Film A.G.
Austrian postcard by Iris Verlag, no. 5472. Photo: Hans Natge, Berlin. Austrian postcard by Iris Verlag, no. 5908. Photo: Hanni Schwarz. German postcard by Ross Verlag, no. 5073/1, 1930-1931. Photo: Münchner Lichtspielkunst AG (Emelka). Austrian postcard by Iris Verlag, no. 5110. Photo: National / Mondial / Gerhard LamprechtFilm-Produktion. 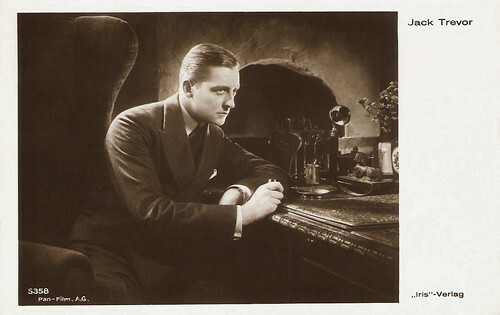 Publicity still for Der Katzensteg/Betrayal (Gerhard Lamprecht, 1927). 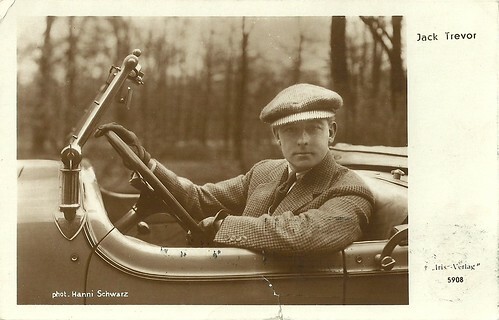 German postcard. Photo: Cicero Film / Distribution Deutsche Tonfilme. The 'fine fleur' of late silent German cinema stars, united for a photo for an early sound film company. 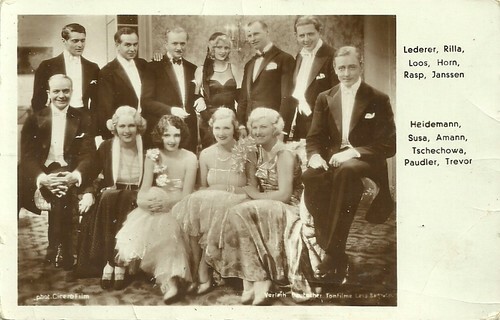 Standing left to right: Francis/Franz Lederer, Walter Rilla, Theodor Loos, Camilla Horn, Fritz Rasp and Walter Janssen, Sitting left to right: Paul Heidemann, Charlotte Susa, Betty Amann, Olga Tschechowa, Maria Paudler and Jack Trevor. Might be publicity for the early sound comedy Die grosse Sehnsucht/The Great Longing (Stefan Szekely/Steve Sekely, 1930), in which all acted, mostly as themselves - only Loos and Horn played characters. The plot was an excuse for 35 stars to debut in a talking picture. The transition to the sound film turned out to be difficult for Jack Trevor. With his insufficient knowledge of the German language he got only a few roles. 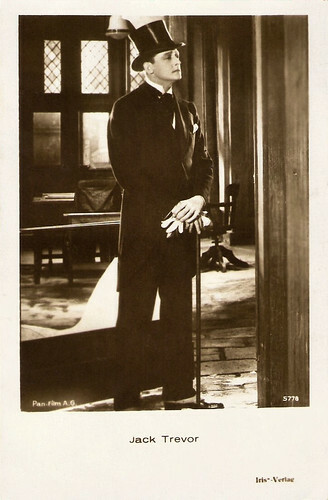 He appeared in the war drama Two Worlds (Ewald André Dupont, 1930), the British language version of Les deux mondes (Ewald André Dupont, 1930), and in Die fünf verfluchten Gentlemen/The Five Accursed Gentlemen (Julien Duvivier, 1931), again an alternate language version of a French film, Les cinq gentlemen maudits (Julien Duvivier, 1931). 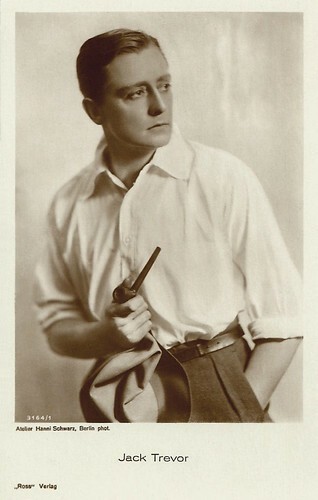 Later Trevor was able to act more often in supporting roles in such films as Henker, Frauen und Soldaten/Hangmen, Women and Soldiers (Johannes Meyer, 1935) with Hans Albers, Engel mit kleinen Fehlern/Angels with Minor Faults (Carl Boese, 1936) with Adele Sandrock, and Der Scheidungsgrund/Grounds for Divorce (Carl Lamac, 1937) with Anny Ondra. Trevor, who owned a huge fortune, travelled through Europe with his two sons of his second marriage and didn't pick up much of the political changes in Germany. In 1939, when the war broke out he was arrested and interrogated by the Gestapo, while his family stayed in Oberammergau. 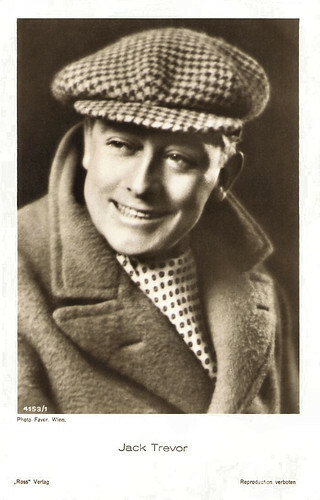 Finally he was forced to take part in anti-British propaganda films like Carl Peters (Herbert Selpin, 1941), Mein Leben für Irland/My Life For Ireland (Max W. Kimmich, 1941) and Ohm Krüger/Uncle Kruger (Hans Steinhoff, 1941) featuring Emil Jannings. Thomas Staedeli writes at Cyranos that after the war Trevor came in “a vicious circle and was extradited to England”. There he was sentenced to prison for three years because of his support to the Nazis. The sentence was quashed again three months later because it was proved that this collaboration didn't come off of his own free will. He could turn again to the pleasant sides of life but he never took part in a film again. 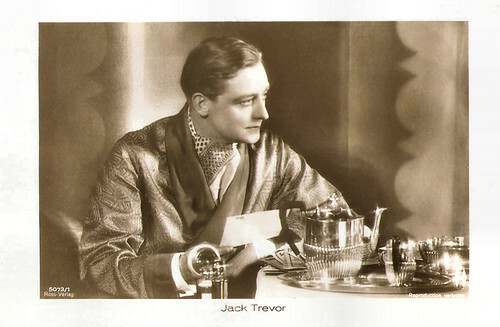 Jack Trevor died in 1976 in Deal, England. He was 86. German postcard by Ross Verlag, no. 3951/1, 1928-1929. Photo: Atelier Natge, Berlin. German postcard by Ross Verlag, no. 3164/1, 1928-1929. Photo: Atelier Hanni Schwarz, Berlin. German postcard by Ross Verlag, no. 5066/1, 1930-1931. Photo: Defina. German postcard by Ross Verlag, no. 5074/1, 1930-1931. German postcard by Ross Verlag, no. 5419/1, 1930-1931. Photo: Atelier Krabbe, Berlin. Austrian postcard by Iris-Verlag, no. 5779. Photo: Abel Produktion / GP / Allianz Film. Sources: Thomas Staedeli (Cyranos), Filmportal.de, Wikipedia and IMDb. I notice in the film clip included that Anny Ondra is carrying what looks like a magician's box. What exactly is the plot of this film? Anny tries to sell the high hat and the magician's trunk, because she needs the money for the rent. But the employee is not interested. The other woman offers her the 5 Mark she needs. Anny wants to do something back for her and offers to help her sell her necklace. And then the trouble and the misunderstandings begin. 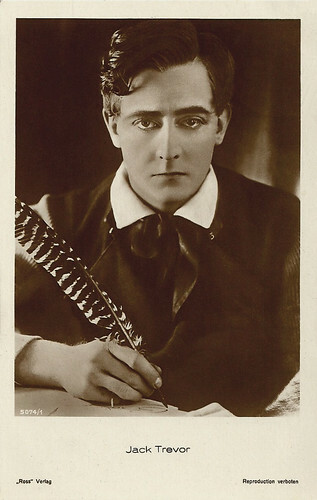 an excellent subject on the actor, I beg you to go to my blog to discover a silent film in song, the French version. Your page is set links on my blog. You made a wonderful tribute at your blog. The film is originally German: Die kleine Dingsda (Conrad Wiene, 1926). "Trude, die Sechzehnjährige" 1926 the same names as an actor? Die kleine Dingsda is the alternative titel for Trude, die Sechzehnjährige. Filmportal.de uses the first, IMDb the second, but it's the same film - your film.